Vox Populi is an ongoing project by Lara Baladi, which includes a series of media initiatives, artworks, publications, an open source timeline and portal into web based archives of the 2011 Egyptian revolution and other global social movements. Protesters in Tahrir Square. © Mosa'ab Elshamy 2011. “…On January 28 2011, I joined the people in Tahrir as a regular citizen. Just as the YouTube video ‘Tiananmen-Cairo Courage in Cairo’ went viral, a friend posted on Facebook a speech Jean Paul Sartre had delivered to an audience of striking French autoworkers 40 years earlier. As the political tension grew, more and more images and videos of a packed Tahrir Square were uploaded. They echoed footage from other uprisings across the Middle East and North Africa, as well as a vast array of past social movements. It was as though Sartre was protesting with us in Tahrir. 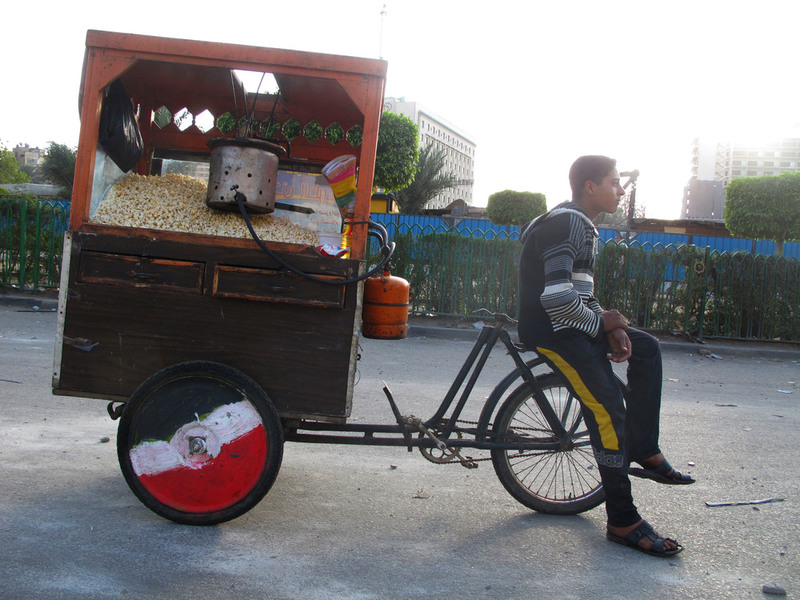 Popcorn vendor in Tahrir Square. © Lara Baladi 2011.